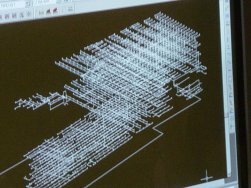 Our engineering technicians provide state of the art computer-aided fire protection systems, including full computer hydraulic design.. Fire sprinkler design drawings are based on the latest NFPA codes, and up to date building codes. All design Cad drawings and computer generated hydraulic calculations are reviewed and stamped by a registered fire protection engineer. We have a complete library of up to date NFPA standards, National Building and Fire Protection Codes and state and local municipality fire sprinkler/building codes. A variety of manufacturer's product specifications that are updated constantly, provide the best possible fire protection design. We provide our staff with the latest in AutoCAD® and Sprinkcad software. Operating on state-of-the-art, fixed and portable computers, also allows on-site survey and design for adding and modifying to existing systems. Changes to equipment or occupancy in a building could necessitate a revaluation of the sprinkler system. We have the ability to upload and/or download drawings and specifications via the Internet. Please contact our design manager, Bill Perry if you have any questions or need additional information at 508-279-0014 or by e-mail at bill.adamsfire@gmail.com.